Mashed potatoes coated in Parmesan cheese and cracker crumbs have the perfect balance of crunchy and creamy and make for a crowd-pleasing side dish. Cook potatoes in boiling water in large saucepan 20 min. or until tender; drain. Mash potatoes until smooth. Stir in all remaining ingredients except cracker crumbs and Parmesan. Shape into 30 (2-inch) oval croquettes, using about 1/4 cup potato mixture for each. 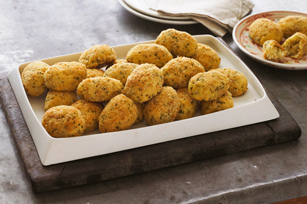 Roll in combined cracker crumbs and Parmesan, turning to evenly coat each croquette. Place on baking sheet sprayed with cooking spray; spray tops and sides with cooking spray. To minimize sticking, spray your hands with cooking spray before shaping the potato mixture into croquettes.